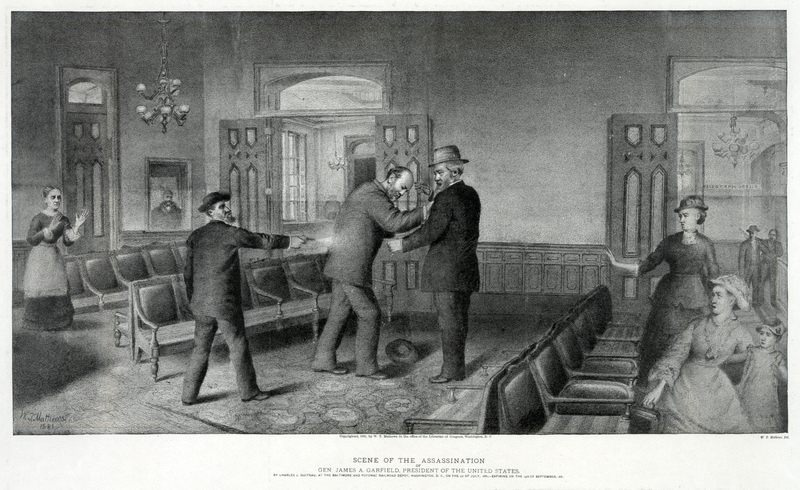 “Assassination of President James A. Garfield,” Histories of the National Mall, accessed April 22, 2019, http://mallhistory.org/items/show/347. On July 2, 1881, a deranged Charles Guiteau shot President James A. Garfield at the Baltimore and Potomac Railway Station. Guiteau was an unsuccessful lawyer, evangelist, and insurance salesman, who thought that the President owed him a government job. Garfield died from complications from the wound on September 19. Pennsylvania Railroad Company placed a plaque and a star on the location of the assassination. However the public often complained that they disliked the reminder of the crime every time they entered the waiting room, and the company removed the commemorative tablet and star in 1897. Today, Garfield's is the only unmarked presidential assassination.